Every scanner comes with software. That software allows the scanner to communicate with your computer, so you can scan your photos and documents, save them on your hard drive, e-mail or print them, and otherwise use them in your normal digital workflow. So, why should you consider spending more money to purchase SilverFast SE ($49, free demo that adds watermarks) to replace your scanner’s own software? Because it may possibly make the difference between okay scans and great ones. The power of SilverFast SE rests in its advanced edit capabilities. Whether the capture device is a scanner or a camera, a basic fact of digital photography is that pre-capture edits produce a better-quality picture than post-capture edits. In simple terms, when you edit your photo in a program such as Photoshop after it has been defined (by the scanner, by your camera or by your Raw conversion software), you are literally destroying image-defining pixels. On the other hand, making edit decisions about the photo before it is defined - before the pixels are created—means that the pixels’ data remain intact. So, when you’re scanning pictures that mean a lot to you, it makes sense to use scanning software that gives you control over how the picture will be defined. SilverFast software has long been recognized for its excellent tools for controlling exposure, color and dynamic range. SilverFast installs as a stand-alone and as a Photoshop-compatible plug-in. While you have several options for using simple predefined settings, such as for skin tones, landscape and such, the power of this program rests in its advanced edit capabilities. Exposure tools include a brightness, contrast and saturation sliders, a histogram, a gamma curve, plus white point/black point. You can even create 48-bit HDR (high dynamic range) images. Color can be fine-tuned using a color wheel or selective color adjustment, plus SilverFast has tools for color restoration (of old, faded pictures) and the ability to use the color channels in the histogram and gamma curve for fine adjustments. Don’t know what all those terms mean or how to use the complicated-looking tools? Don’t worry. The QuickTime movie tutorials, which are accessible from within dialogs, are a big help. Once you start using SilverFast SE, the immediate feedback from your visual results will help you understand better than any tutorial. So, just try them out, you may be hooked by their versatility and the power they give you for superior image quality. SilverFast engineers its software to specific scanners, so to download, you need to state the exact scanner model you are using. The size of the download will also vary depending on the scanner. System requirements and operating system compatibility issues are generally a factor of the scanner itself, rather than of SilverFast. SilverFast SE is the junior sibling of several other scanning and digital camera products, which provide even more tools for control over your scanning, including SilverFast SE Plus, SilverFast AI and SilverFast AI Studio. The latter two are the professional versions with some of the most powerful pre-scan edit tools around, plus optional calibration targets for assuring that the colors your scanner produces are accurate. SE Plus costs about $89, and the two AI products range in price from $99 to $499, depending on the scanner and whether or not you purchase a calibration target. Check the vendor’s feature comparison chart to see which one best suits your needs. No question about it, SilverFast SE is not for everyone. If you just want to get a quick scan of your photo, whatever software came with your device will probably work just fine for your needs. 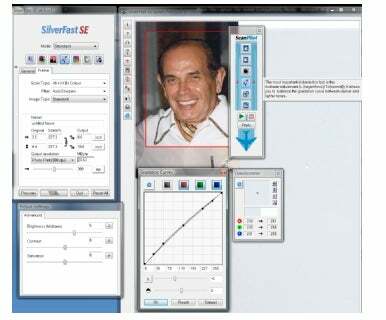 But if image quality is a high priority for you, check out the trial download of SilverFast SE. This story, "With SilverFast SE, your scans look more like the originals" was originally published by PCWorld.